Nails are used to secure the perimeter and the field of an artificial grass installation. 1. 5-inch, 40DD, 4GA bright common nails – these are generally installed every 3-6 inches along the perimeter and every 2 feet on center in the field. The amount of nails used varies with the shape of the artificial grass installation, the size of the installation, and the amount of seaming the installation requires. As an example, a 400 square foot installation that is 4’ × 100’ would require more nails than a 400 square foot installation that is a 20’ × 20’ area. 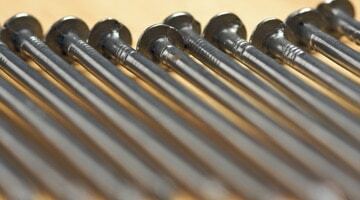 Your exact project size, layout, seaming patterns, etc., will determine how many nails are required. d. We recommend bright common (as opposed to galvanized) nails in this case. A little rust isgood because it causes the base of the nail to expand and results in the nail bonding to some of the sand/gravel in the base – effectively making the nail larger than the hole it was originally pushed through. Additionally, the 5 inch nails are thick enough that once the outer layer oxidizes, the corrosion process stops, and as such the nail does not rust all the way through. 2. 3” finishing nails – these are used for putting green installations. You do not want to use a 5-inch nail in a putting grass installation because you cannot hide the head of a 5-inch nail in the short, dense putting green products. Generally, they are used along the perimeter and around cups. They come in 1 lb. boxes and a good rule of thumb is that you’ll need one box for every cup the customer plans on installing. This does not mean that you’ll use a full box around a cup, but rather the number of cups is typically associated with the size of the putting green and is generally correlated to the amount of 3-inch finishing nails that should be used.